Teens from the Valley were part of the 2,000 teens who attended the ninth annual International Shabbaton organized by the Chabad Teen Network (CTeen) in New York City in February. Shevet Shemesh high school students attended a national gathering of Israel Scouts chapters Feb. 16-20. Elise practices CPR compressions in her Hebrew High class, "CPR and Jewish Ethics of Saving a Life." Salk BBYO overtakes NCSY 2 in a hard-fought win during a recent basketball game through The League. In Scottsdale, BBYO chapters will meet at 7 p.m. Mondays at the VOSJCC. Email mtn@bbyo.org. In the East Valley, BBYO chapters meet at 7 p.m. Tuesdays at the East Valley JCC, 908 N. Alma School Road, Chandler. Contact: Aaron Wiener, East Valley supervisor, awiener@bbyo.org. High school seniors are invited to a I Love Israel conference 6-11 p.m. Saturday, April 1, at the Ina Levine Jewish Community Campus, 12701 N. Scottsdale Road, Scottsdale. The program, with support from StandWithUs, will address Israel advocacy to counter BDS (boycott, divestments and sanctions) on campus, basic historical facts and information about Israel, college programs in Israel, Israel’s global contributions and how to build a community on campus. Visit bjephoenix.org or call Myra Shindler, 480-634-8050. “Escape from Egypt!” a Passover-themed escape room event, will be held 10:30 a.m.-2 p.m. Sunday, April 2, for CTeen Junior (middle school students) and 7-8:30 p.m. Monday, April 3 for CTeen (high school students). Both will be held at the Pollack Chabad Center for Jewish Life, 875 N. McClintock Drive, Chandler. CTeen, for high school teens, recently started a Torah Talks class that meets at different homes. Last month, the local CTeen chapter joined about 2,000 other CTeens in New York for the international NYC Teen Shabbaton. Other recent activities included making hamantaschen for Purim and a Shabbos in Mexico event with a burrito bar. Email rabbi.t@chabadcenter.com. The Friendship Circle pairs teens with children with special needs for shared social experiences. Visit fcaz.org. Teens are invited to sign up for one or two mini-courses for Hebrew High. Classes include Jewish Film Shorts, Stairway to Heaven, Israel Experience Orientation, Jewish Musicians Group, Torah Yoga and a Different Night. Cost is $125. Email Myra Shindler, myras@bjephoenix.org. Jewish Student Union (JSU) will hold a community event 5:30 p.m. Sunday, April 2, at a private home in Phoenix. The event will honor club leaders and celebrate JSU’s impact on the Phoenix Jewish community. There is a $36 suggested donation for adults, which includes a buffet dinner. Students are free. To register, visit arizonancsy.org/jsu-dinner. Email shmuli@dojus.org with questions. 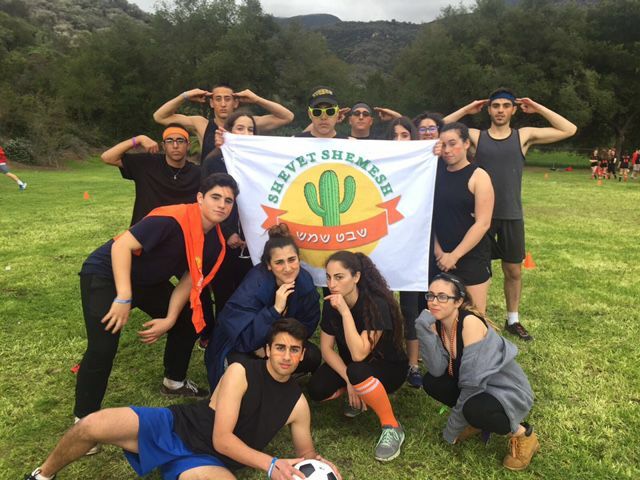 Games for the Jewish Youth Group Sports League – known as “The League” are held 5-7 p.m. Sundays at the Valley of the Sun Jewish Community Center, 12701 N. Scottsdale Road, Scottsdale. The League is facilitated by the VOSJCC for members of Jewish youth groups (BBYO, NCSY, NFTY and USY). All teens are welcome. The League is funded, in part, by a grant from the Jewish Community Foundation of Greater Phoenix. For more information on the upcoming season, contact Alexa Wollach, alexaw@vosjcc.org or 480-483-7121. Team Phoenix has formed for the 2017 Birmingham JCC Maccabi Games, to be held July 30-Aug 4. The Games are an Olympic-style event that is the largest annual Jewish teen event in the country. Sports include boys & girls basketball, golf, tennis, table tennis, swimming, dance, soccer, star reporter and track & field. For more information, contact Alexa Wollach, alexaw@vosjcc.org or 480-483-7121. Temple Chai TCTY will walk in the Phoenix Pride Parade with other members of Temple Chai. To join the walk, email ewynn@templechai.com. Other TCTY events include “Games on a Timer” for grades 9-12, 3:30-5 p.m. Sunday, April 23, at the Valley of the Sun JCC, a TCTY/Chai School Shabbat on April 28 and elections on April 30. High school students in Shevet Shemesh, the Arizona chapter of the Israeli Scouts, traveled to Los Angeles in February to participate in a national gathering of high school members in Israel Scout chapters. They learned about Jewish and Israeli identity, participated in a sport competition and performed in a dance. Visit shevetshemesh.com. Beth El USY is hosting a chocolate seder for grades 3-12, 12:15-1:45 p.m. Sunday, April 2, at Beth El Congregation. Contact Nanci, 602-944-3359, ext. 123, or nsiegelmanson@bethelphoenix.com.